Protect your Sansa e260 Player! Clear tough polycarbonate case with anodized aluminum flip-cover. Your Sansa E200 Series player stays protected while traveling, and when you get where you're going, flip the cover open and your case becomes a stand. 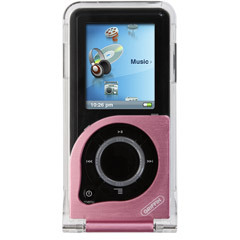 Polycarbonate Case for Sansa E200 player-- Light pink metal on small portion of the case opens up and can be sed as a stand. Note: only for use with E200 Series players. Not for use with any other players including the Clip models. Use for Sansa e250, e260, e270, e280.